Get Free Shipping on select products within the Continental United States! Burn Time - 70 Hrs! 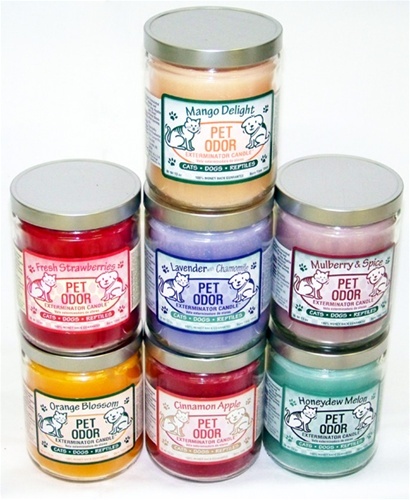 Their Enzyme Formulated Candle® doesn’t just mask pet odors, it actually eliminates them. Fresh Strawberries - Just picked from the field and delivered fresh to you… this new fragrance is the essence of summertime. Fresh strawberries will tempt your taste buds with it's light, fresh and simply delicious, ready to eat strawberry scent. Please Note: These candles are shipped separately from any items that the beautiful but intense aromas might effect. Candle colors are not representative of actual products. An actual picture of Vanilla Creme, Mango Delight, Honeydew Melon, Orange Blossom and Cinnamon Apple is available if you click the image.